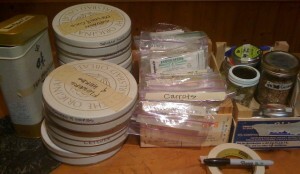 Old seed storage system on left,new system in the middle and jars for the home-grown seeds on the right. ‘Tis the season of seeds! A time to organize and order seeds for the up-coming season while other garden-related tasks are at a standstill and before the seed companies get too busy. My process starts at the computer,updating the Excel seed list,highlighting any seed varieties or types that are out and that need to be purchased. Then I study the seed catalogs,deciding whether to order the same varieties as before or to try something new. It’s an OK system but every year,I end up spending a little time searching the web to see if anyone has a better idea or has developed a brilliant new tool for keeping track of seeds. In that pursuit, I recently came across this video presenting a very simple and elegant system for storing seeds. For years I had stored mine in Oblaten tins because they were available,having received the delicate wafers as a gift every Christmas. I couldn’t bear to throw out such nice tins so ended up storing seeds in them. It wasn’t a bad system —the tins were tight and kept moisture out but the round shape was clumsy to use and space consuming. Plus I had to group seeds in into broad categories like “roots”and “tomato family”that meant sorting through a pile to get to the ones I needed. Once I saw how much easier and efficient it would be to store “carrots”separately from “radishes”in clear, ziplock sandwich plastic bags,I immediately made the switch. Goodbye tins,hello baggies. Hope this will be the first of many new and improved gardening systems for 2011!